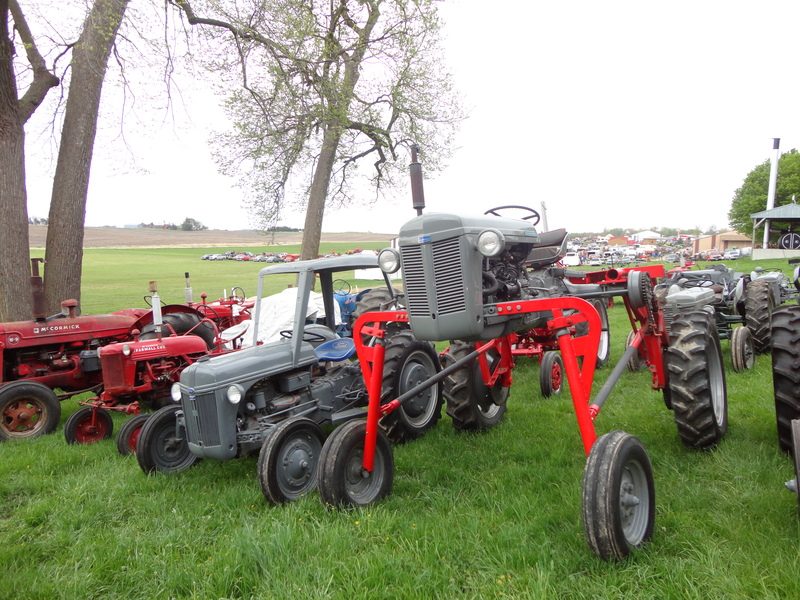 Winter holds on a bit longer in Minnesota than here in central Illinois so I was not quite prepared for the chill of the 35th Le Sueur County Pioneer Power Swap Meet, but as a flea market junkie, I attest that you could find almost anything you were looking for at this event! It didn’t take long for me to buy a garden art pig made from a big spring. The pig is now residing on my back porch with my gas tank turkey I call “Gobble” The pig may be called Ard because a man stopped to admire my pig but thought he was an ardvark! After shopping for yard art from my favorite garden artist, I purchased a lovely rag rug and I was a happy camper. I was even happier when I spied these beautiful Ford tractors under the trees. These were rather rare models and the kit to make this Ford a hicrop is an unusual commodity by itself! My husband found some tires and a driver of a loader convenintly loaded them right into the back of our pickup truck. Although the swap meet is over, there is still plenty of time to plan to attend the upcoming fall power show scheduled for August 24, 25 and 26, 2012. This year’s featured brand is Massey Combines, tractors and Wallis equipment. For more information about the event, check out their website http://www.pioneerpowershow.com/swapmeet.html.